1.99 ACRES (86,684 Sq.Ft.) of flat, fenced (chain link) land in Southwestern Riverside County. This property has a single wide mobile home (400 Sq Ft.) on parcel that has no value. Electricity (SCE) and water (EMWD) to parcel. Propane and septic area. Parcel sits on dirt road with a wide 237' frontage. Side boundaries are 386 feet. Fourth parcel from newly paved Street, known as Juniper Flats Rd. approximately 500 feet from Northwest corner. Property is approximately 7 miles from Highway 74. Easy access to I-215. Realigned Hwy 79 beginning construction for easy commute to all surrounding communities. Extremely private rural area yet very close to new shopping, schools, medical, church's, parks and other services, minutes away. Mobile homes allowed. Horses and farm animals allowed. Miles of riding trails. Flat land includes trees with many garden and planting areas. Location has Lake Perris, Elsinore and Diamond recreational boating, picnicking, hiking and additional newly developed and currently planned family activities. 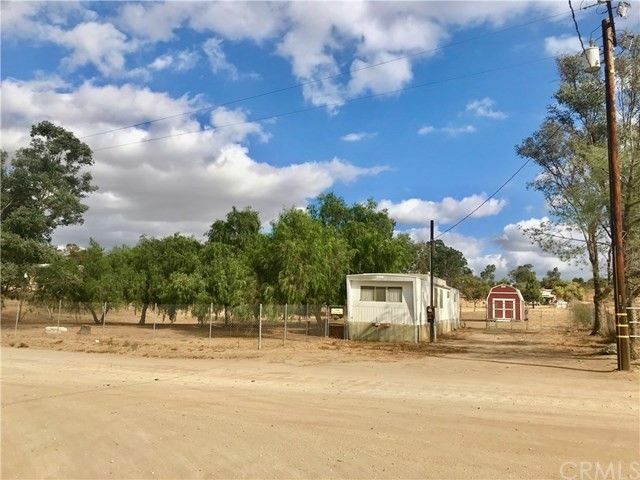 Situated between Nuevo, and Menifee Valley. Fastest growing County in Southern California. Easy access to mountains, beaches and deserts. Improvements: Fenced, Utilites On Site.